You probably already know that real estate is the best way to build wealth and get a high return on investment. In fact, more millionaires in this country attained their wealth via real estate than any other means. So why don’t financial advisors recommend real estate investing to their clients? This is a question I’ve always wondered, so I’m excited to bring you this show! On this episode of Investing in Real Estate, I’m interviewing Brent Sutherland, a financial planner and real estate investor. Brent is pulling back the curtain and discussing his insight into the world of financial planning. We’ll talk about how financial advisors get paid, and the general lack of education in the industry. I’ve always thought that if financial planners had their clients’ best interest at heart, they would recommend real estate investing. But, that’s not a common occurrence, so there must be a reason why. That’s why I sat down with Brent Sutherland to hear the truth about financial advisors. Brent explains that there are two main reasons why financial advisors aren’t quick to recommend real estate. First of all, it has to do with their compensation plan. Traditionally, financial advisors are paid a commission-based wage. They’re licensed to sell investment vehicles like stocks, bonds, and annuities. Financial advisors don’t get paid when they recommend real estate, nor are they licensed to do so. Also, there’s a general lack of education about real estate investing in the traditional advisory world. Most financial advisors simply are not well versed about the merits of real estate. But Brent is different—in his career as a financial advisor, he noticed that most successful, wealthy people had something in common: a robust real estate portfolio! Once he began educating himself about the benefits of real estate investing, he realized it was something that he wanted to pursue personally, as well as help his clients understand. He eventually started his own practice where he helps people truly build wealth and attain financial freedom. On today’s show, you’ll learn about how to create your own pension plan, and why diversification doesn’t matter if you lose your job. Brent is also sharing his Freedom Number, and the importance of cash flow for financial freedom. 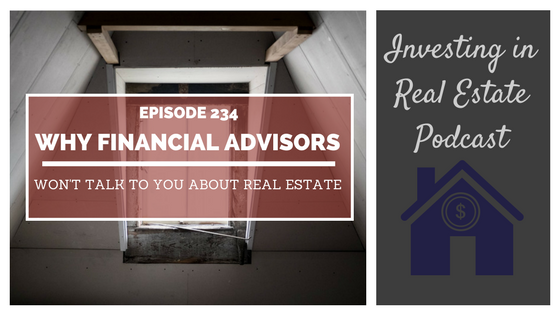 Don’t miss episode 234 to hear more about why financial advisors won’t recommend investing in real estate! What questions should you ask your financial advisor? What is Brent's Freedom Number? What are the two forms of compensation that most financial advisor receive? EP235: What Is an Accredited Investor?